We had an agreement of sale for 22 Battens Lane yesterday! The people present (pic 1) were Elinor Kershaw, trustee, future resident and mum to Alice Kershaw (aged 5); David Mowat, adviser; Tony Crofts, founder and trustee; James Deane, future resident; vendor Jason Fuller; Chris Askew and Nerea Gonzalez, architects. The second pic shows the interior with Alice, Elinor and James. So, lots of potential! Please buy shares to help us buy the place outright (we’re negotiating for a 90 day completion period and putting deposit down now) so we don’t have to go for an expensive bridging loan. Share forms and details on the Invest page. 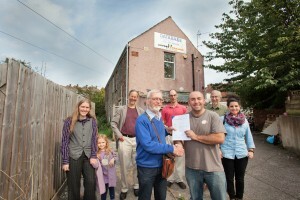 Members of the Abolish Empty Office Buildings campaign in St George, Bristol, agree the purchase of their first Empty Office, which the campaign will convert into affordable flats for people to live in as part of a new social housing co-operative in Bristol. Left to right: Elinor Kershaw, trustee, future resident and mum to Alice Kershaw (6); David Mowat, adviser; Tony Crofts, founder and trustee; James Deane, future resident; vendor Jason Fuller; Chris Askew and Nerea Gonzalez, architects. 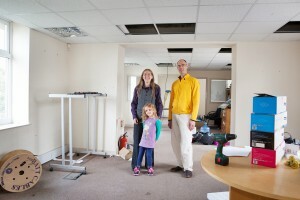 Members of the residents’ group of the Abolish Empty Office Buildings campaign, Alice Kershaw (6) Elinor Kershaw and James Deane, take a look at the first office property the group is going to buy in St George, Bristol, for conversion to a social housing co-operative.